In orthodontics, preserving the space available in the dental arches for the eruption of the permanent teeth is essential during the development of the dentition in order to minimize eruption problems and ensure that teeth erupt in the best possible position. The space available in the dental arches is affected by the difference in width of the temporary teeth compared to the width of the permanent teeth. It is all in space! To know more. Adequate supervision and follow-up by the orthodontist through clinical examination supplemented with radiographs will allow early detection of developmental anomalies and eruption problems. When indicated, certain interventions may be recommended to minimize the possible impact of these problems. Can be a removable appliance (that can be removed by the patient) or fixed (that cannot be removed). Inserting space maintainers in the mouth and wearing them is not painful or uncomfortable when the appliances are well made and adapted to the dentition. 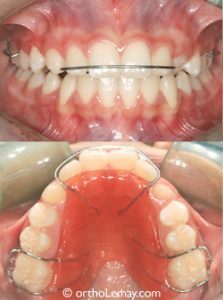 Will a space maintainer “prevent having braces”? Using a space maintainer does not guarantee that the teeth that have not erupted yet will do so correctly or that the occlusion (bite) will be adequate once the permanent dentition is completed. Indeed, in most cases, even if such an appliance is used, it must be expected that other teeth will still erupt with significant irregularities or malpositions if the space deficiency was severe to start with. If this were the case, further corrections using corrective appliances (braces) may be necessary to optimize dental function and esthetics. If this is the case, we will inform you in due time about the required procedures and related costs. These appliances are often utilized when there is an important lack of space for the eruption of the permanent teeth and when teeth have an abnormal eruption pattern (which is visible on a panoramic radiograph). So using a maintainer has the sole purpose of preserving this space during eruption of teeth instead of creating more space to ensure an eruption without problems. The purpose of using space maintainers is thus not “to avoid braces later on” because the problem is already present when this interceptive intervention is performed. It is important to mention again that the orthodontic supervision while a space maintainer is worn must be considered as a preliminary step aimed at facilitating the eruption of the teeth. This intervention does not move or correct teeth to improve their position or alignment. After a short adaptation period, it does not interfere with speech or mastication. Serial extractions and the use of a lower space maintainer have helped the permanent teeth erupt in a better position without losing space. Adaptation to upper or lower space maintainers is quite fast. After a short period, speech and phonetics are practically normal and no real discomfort is experienced in wearing them if they are adequately adapted to the dentition. Using a removable upper space maintainer allowed better eruption of the permanent teeth. The patient’s cooperation with a removable appliance is questionable. Parents are more suited to evaluate their child’s cooperation and sometimes prefer a fixed appliance to avoid having their child lose the appliance if they believe that he/she will not be diligent in wearing it or storing it properly. The fixed upper space maintainer is similar to the one used in the mandibular arch. (A) A 8-year-old girl presenting severe space deficiency. (B) Fixed space maintainer in the mouth at 10.5 years of age; no space was lost, but there is still a lot missing to lodge the canines that have not yet erupted. The situation would have been worse without using a maintainer. The maintainer does not create space… it only preserves what is available. (C) Another example of a fixed maintainer where the teeth have erupted properly in the space that was preserved by using the appliance. The patient is now ready for the corrective phase. If one of the bands of a fixed lower maintainer becomes mobile or loose, it is debonded and must be cemented again. If this happens, communicate with us as soon as possible so that we can fix the problem before caries develop under the band. Putting the appliance in your pockets and accidentally sitting on it! Not having kept the appliance out of the reach of young children and pets (dogs, cats…). Orthodontic appliances are not toys! Not having worn the appliance many consecutive days or weeks; this may allow the teeth to move and the removable appliance will not be well adapted to the teeth. When a removable appliance is inserted into the mouth, it is quite “tight”. The anterior hooks and wire may be adjusted to apply a pressure that is more or less strong to hold the appliance on the teeth. Contact between the acrylic and the palatal mucus membrane contributes to the retention of the appliance in the mouth as well. 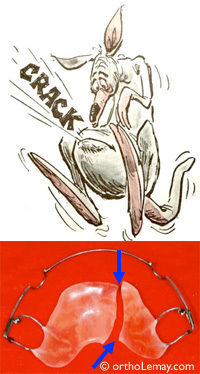 With time, the hooks may become loose and make the space maintainer looser or mobile. Some people prefer an appliance that is very tight while other wish that it is barely held by the hooks and labial wire. Most importantly, the appliance must be worn regularly. The fact that it is loose or tight in the mouth does not change how efficient it is at all and this becomes more a question of taste or personal preference from patients. If the appliance is worn properly, it will play its role and will preserve the available space during tooth eruption. However, if the appliance is too loose and cannot hold in the mouth properly, it will not be efficient. Communicate with us in that case so we can fix the problem. Minor repairs can usually be done in our in-house laboratory (repair fees may apply). If you notice that your appliance is damaged or doesn’t fit properly and cannot be worn as prescribed, contact us as soon as possible to schedule an appointment. If you lost your retainer or it is damaged beyond repair, it may have to be replaced by a new one if it is still indicated to wear one (a replacement fee will apply). Always bring your appliances to your appointments so that we can adjust them is necessary. Wearing such an appliance for several months may allow to obtain vertical changes in the way the teeth close together by allowing the eruption of the posterior teeth. The anterior teeth of both arches will become separated from one another. Allows the posterior teeth to continue their normal eruption path and thus provide better support to the dentition. (A) The bite plane is used when excessive overbite exists between the anterior teeth (blue circle). (B) Adding the bite plane (pink) allows the lower incisors to bite on the plane rather than near the palate or in the palatal mucous membrane. This slightly moves the mandible downward when opening the mouth (arrows). (C) If the appliance is worn continuously, after several months, the posterior teeth will start migrating upward (eruption) in an attempt to re-establish contact with the opposing teeth (arrows). (D) After some time, the posterior teeth will touch and if the appliance is removed, we will notice that the lower incisors are now apart from the upper incisors. (A) Excessive overbite (vertical overlap) of the front teeth. (B) With a “bite plane” in place, the posterior teeth do not touch and the lower anterior teeth do not bite into the palate. (C) After a few months, the anterior teeth do not overlap as much when the appliance is removed and the posterior teeth touch. Use of a bite plane also acting as a space maintainer allowed the lower anterior teeth to become more visible while decreasing the overbite as the posterior teeth erupted more easily. Photos: (A) Before the intervention: excessive overbite, lower anterior teeth completely hidden by the upper teeth. (B) Bite plane inserted in the mouth. (C) After 6 to 8 months, the lower anterior teeth are now visible when the appliance is removed. Another example of the use of a bite plane to help decrease the excessive anterior overbite. (A) Malocclusion with excessive overbite. (B) The use of a bite plane to decrease the overbite and allow the eruption of the posterior teeth. (A) 10-year-old young girl with excessive overbite of the anterior teeth; the lower teeth bite into the palate. (B) Inserting the bite plane. The arrows indicate the dental movements that will occur while the appliance is worn simply by separating the teeth in both arches. (C) After 8 months, still with the appliance in the mouth, we notice that the posterior teeth got closer to one another and touch. (D) This relationship is maintained once the appliance is removed. The dotted line allows the comparison between the position of teeth from the beginning to the end. ➡ To learn more about this case. A bite plane can also be used during orthodontic corrections to help reduce the vertical overlap between opposing teeth and thus facilitate dental movements and bite opening. (A) Dentition where the upper teeth excessively cover the lower teeth. (B) Bite plane that separates the lower teeth. (A) Severe dental malocclusion (adult, 37 years of age) with excessive overbite of the anterior teeth. (B) With the appliance (bite plane) in the mouth at the beginning of treatment. (C) During the orthodontic corrections toward the end of treatment. (C) Final result; the teeth are well separated and more functional. The gum problem present at the beginning is stable. Examples of eruption problems where space management was inadequate. 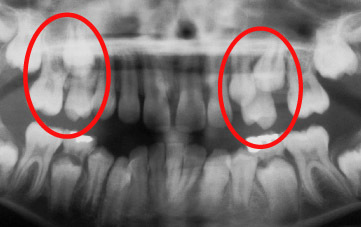 Permanent upper right canine that erupts above a temporary tooth that has not fallen off (arrow). It is sometimes indicated to extract temporary teeth to facilitate the eruption of permanent teeth. An X-ray allows us to detect in this 12-year-old girl a serious eruption problem; both upper canines are impacted and are heading toward the palate. Examination of the dentition without X-rays makes this diagnosis difficult to make. Examples of bad space management during the eruption of permanent teeth. The available space was not preserved, teeth migrated, space was lost and the eruption of some teeth occurred outside the dental arch. This kind of problems can usually be avoided with good supervision during the eruption of teeth. Tooth migration and space loss leading to eruption problems. Two upper premolars are completely blocked and cannot erupt properly following inadequate supervision during dental development. Proper space maintenance during the eruption of teeth could have avoided these problems. Inadequate supervision in the mandibular arch. (A) The forward migration of the molars creates space deficiency that prevents the eruption of the lower second premolars. Using a space maintainer could have prevented this problem or minimized it. (B) The orthodontic corrections repositioned the teeth where they should have been maintained by a maintainer when they were erupting. ➡To see other examples of eruption problems and how X-rays can help detect them. Even though this appliance is not made specifically to relieve headaches, using a bite plane in people having such symptoms and an important malocclusion where the overbite is excessive may sometimes relieve them to a certain degree or reduce the symptoms. We cannot “guarantee” or promise any improvement whatsoever, but it is possible to see, mostly in children, an important decrease in the frequency and severity of different symptoms when using a bite plane. The pictures below show a 9-year-old young girl (A) and an 8-year-old girl (B) having a very deep anterior bite and complaining about frequent headaches. The use of a bite plane to separate the upper teeth from the lower teeth reduced the symptoms significantly in the first case and completely in the second in only a few weeks. One year later, the symptoms are still absent. Please note that this does not mean that a bad bite or a malocclusion was the cause of headaches but we occasionally see children with deep bites complaining of headaches. We insist on the fact that we do not attempt to treat headaches and migraines using an orthodontic appliance, but we simply report that we have observed, in several occasions, the reduction of some symptoms when wearing such an appliance. The effect of such appliance may be similar to using an occlusal splint in cases presenting joint problems accompanied by various symptoms.